Do you love working with children & swimming? We have a great part time job for you! We are hiring caring swim instructors to join our teaching staff at Splash! Please give us a call #262-512-7946 if you would like to learn more, and please feel free to share with any of your friends/family that may be a perfect fit. Thank you very much, and we look forward to hearing from you! ➡ We are HIRING caring Swim Instructors & Lifeguards! 1. Lead small group, semi-private and ​possibly ​private lessons to ​children of ​all ages & abilities. 2. Create a fun & supportive environment for your students; ​as well as ​have the ability to motivate, calm​, ​reassure​ and correctly evaluate & guide them in the water. 3. Build strong relationships with your students, and recommend returning classes based on skill levels you observe. 4. Complete ​​necessary training for our swim program​, which Splash! Swim + Wellness will provide.​ This is also an opportunity for you to receive free Lifeguard certification. 6. Have reliable transportation and flexibility.​ ​We, in turn, will do the best we can to work with your schedule​.​ We can offer very flexible scheduling for those of you that have limited availability, such as high school/college students. We can have shifts as short as 2 hours or 4 hours to accommodate your schedule. You may also take sessions “off” and return back to Splash during a session that is more convenient for you. We typically have 6 sessions per year. 7. Live close enough to Mequon, WI, to make the commute practical. ​8. Be punctual, since our classes run on an exact schedule. ​9. Have a passion for water safety and drowning prevention. If you become a swim instructor with us, you will be entitled to one free birthday party per year at our facility. Also, if you have children, one child in your family can take free swim lessons at Splash, and your whole immediate family can attend family open swim. You can also attend our Adult Water Fitness classes for free. 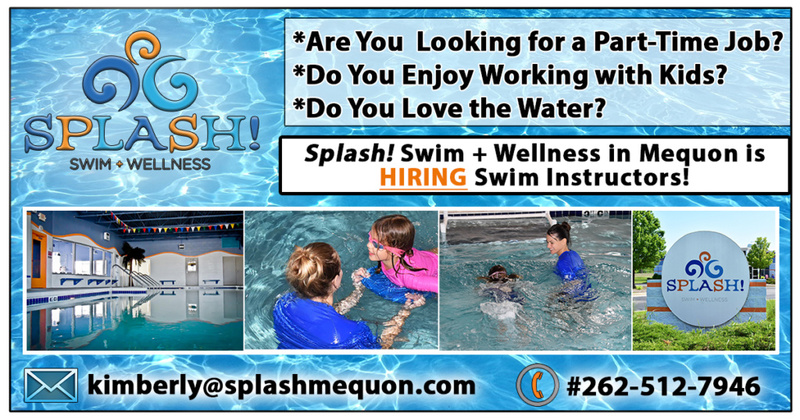 If you are interested in applying, or you know someone that might be a great fit for these positions, please contact Kimberly Metz at #262-512-7946 or email: kimberly at splashmequon dot com. Thank you! 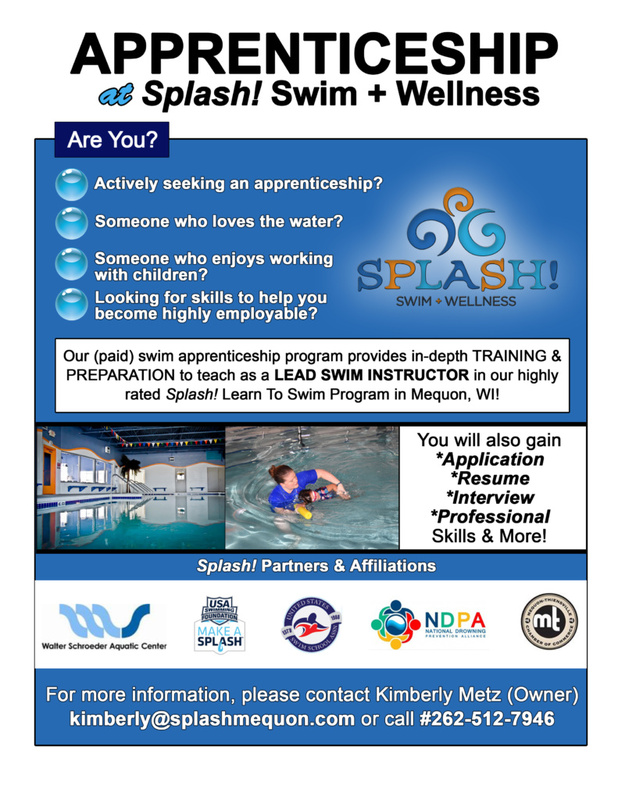 Here is our Splash Swim & Wellness Employment Application. Feel free to download & fill out. We look very forward to hearing from you!! ➡ We are also looking for a caring, energetic & reliable ADULT WATER FITNESS INSTRUCTOR! Adult water fitness classes are held at 8:00am and 12:30pm on weekdays Monday – Friday. This is a part-time position of around 10 hours per week. We are also willing to be flexible with your schedule, if you cannot teach all the classes, or can only teach certain days. Certification is not required, but previous experience teaching water (or land) fitness classes is required. We also provide additional training. A positive, energetic attitude, good time management, a love for the water & a passion for helping others with their physical fitness is a must. 🙂 Other teaching opportunities may be available as well, if you would be interested. Please contact owner Kimberly Metz for details. Call #262-512-7946 or email: swim at splashmequon dot com. Thank you! Splash! also has a paid swim apprenticeship program that provides in-depth training and preparation to teach as a Lead Swim Instructor here at Splash! You will also gain application, resume, interview, and professional skills. Please contact owner Kimberly Metz for more information at #262-512-7946 or email : kimberly at splashmequon dot com. Thank you & we look forward to hearing from you!